Posing for a photo on a footbridge over the Lyde River. 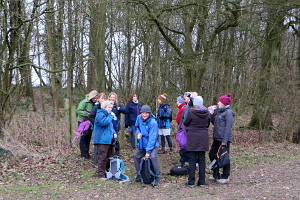 Fourteen of us, including a few visitors from local groups, met up for the first walk of the year on a dry but dull Sunday morning. Leaving the car park in Sherfield-on-Loddon, we headed up the old Reading Road and crossed the busy A33 to begin following the River Loddon. Shortly after passing the weir at Longbridge Mill, we left the river to join the Brenda Parker Way. Named after a once very active Ramblers campaigner, this long-distance path was opened in 2011, three years after her death. 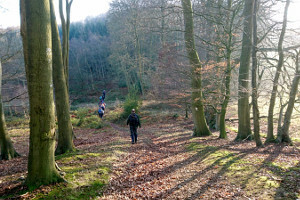 The 78 mile route stretches between Andover and Aldershot, and sections of it have featured in several of our walks. After passing through a few fields on the outskirts of Hartley Wespall, the route began to follow the Lyde River, a tributary to the River Loddon. We crossed the Lyde River by Mill Farm, continuing on the Brenda Parker Way as it alternated between following the Loddon and the Lyde. 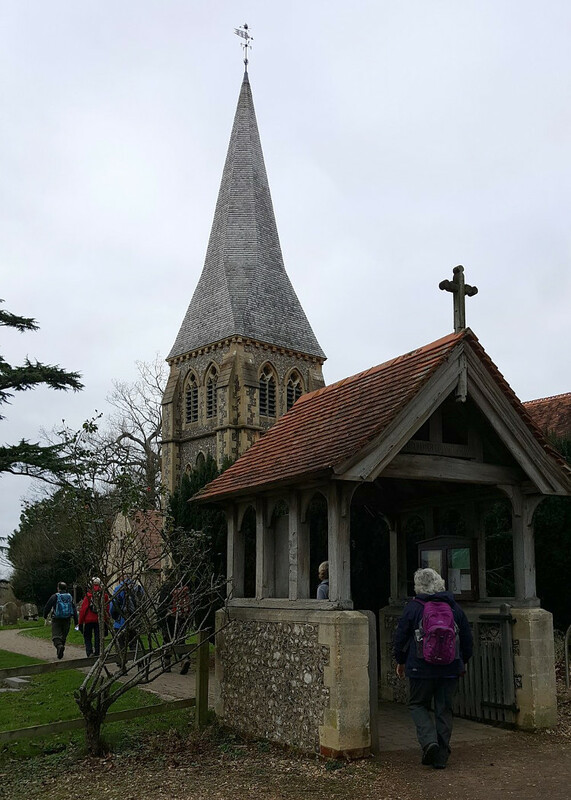 Leaving the two rivers, the route took us through farmland until we reached the church at Rotherwick. Here we left the Brenda Parker Way and followed a route of my own devising. Lychgate at Saint Leonard's Church. 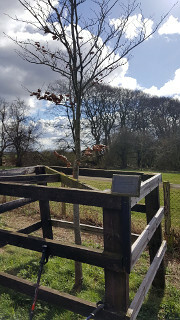 Skirting the top of Tylney Park golf course, we were soon crossing farmland again on a well-defined and fenced path. Here we saw a number of Galloway cattle, casually observing us as they munched on their lunch of hay. Soon it was our turn for lunch, stopping for a picnic on the edge of a large empty field a bit further on. 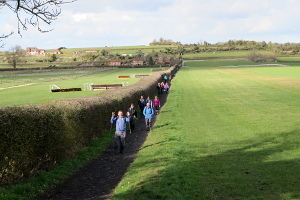 After lunch, we continued our way through fields and woodland until we reached Church End. 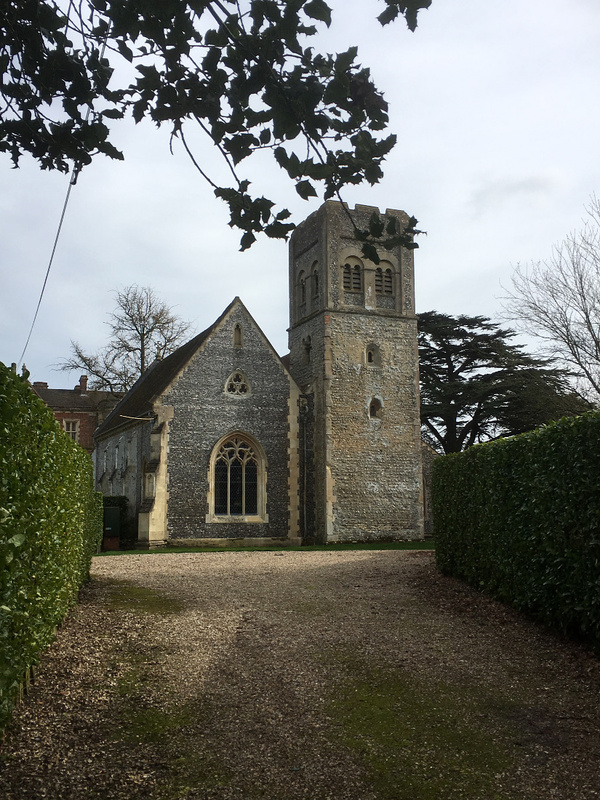 A bit of road walking took us the the A33, which we crossed and entered the grounds of St Leonard's Church at Sherfield Court. Following the footpath through the church grounds, we emerged into more farmland. Passing a terrace of narrow fields containing horses, we were greeted by a couple of young women who were cheerfully shovelling up the horse manure. Soon we were crossing Sherfield Green on our way back to the car park. See our route on Google Maps. Quite a few of us stayed on after the walk for a drink at the Four Horseshoes pub before heading home. Thank you to Denise and Keith for taking the photos while I got on with leading the walk. Stopping for a drink of water near Cassy Fields Farm. Setting off from the brewery's car park, we walked through the village of Yattendon, leaving it on a footpath by the church. This took us north-east, through woodland and fields, in the general direction of Ashampstead. 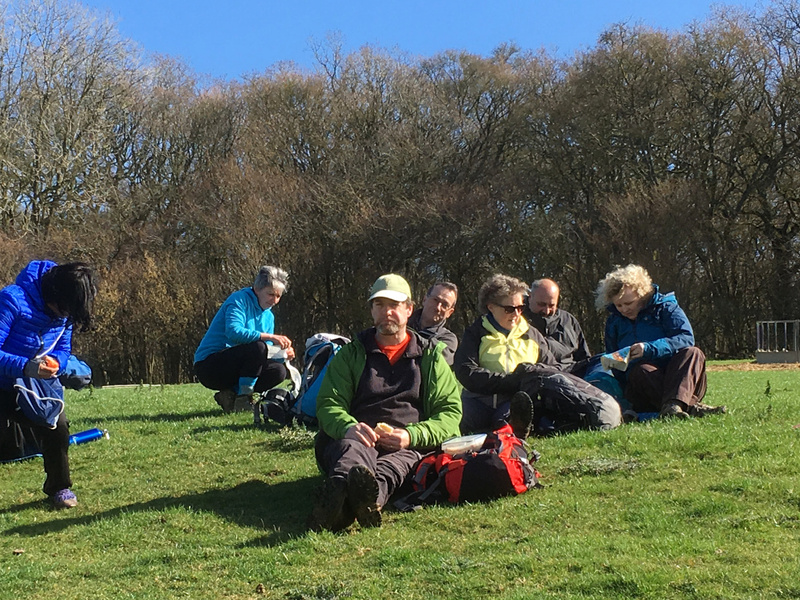 After stopping for a water-break near Cassy Fields Farm, we turned east to join a track called Pinfold Lane, which we followed southward, through Greenaway's Copse, Lye Wood and Gravelpit Copse, to Burnt Hill. 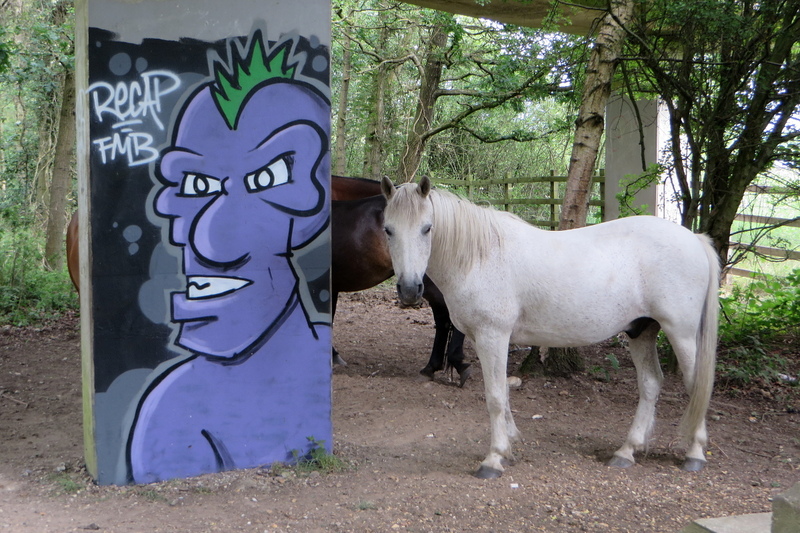 Passing through Lye Wood on our way back to Yattendon. We walked along a quiet lane through the hamlet of Burnt Hill, passing a tiny Methodist Chapel about the size of a single garage. The sound of the M4 motorway gradually became more noticeable as we followed the lane through Tanner's Copse. Then we took a footpath that ran parallel to the motorway for a short while before heading through Frilsham Park and emerging in the grounds of the West Berkshire Brewery! See our route on Google Maps. A few of the group said there goodbyes and left, while the rest of us went into the Taproom & Kitchen for a drink and some lunch. 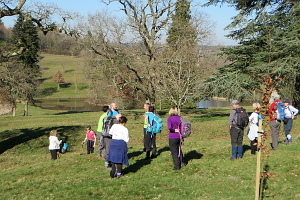 What a splendid way to combine a walk and a social event. Thank you to Mike and Alison for leading the walk and organising the drink and meal. More dogs than walkers on Upper Maidensgrove Common. Twenty-one of us met up on Sunday 20th January; a mixture of regulars, not-so-regulars and newcomers. It was one of those bright winter days with sunshine, blue skies, no breeze to speak of, and ice in the puddles. A real treat after the succession of miserable grey days we've been having so far this year. 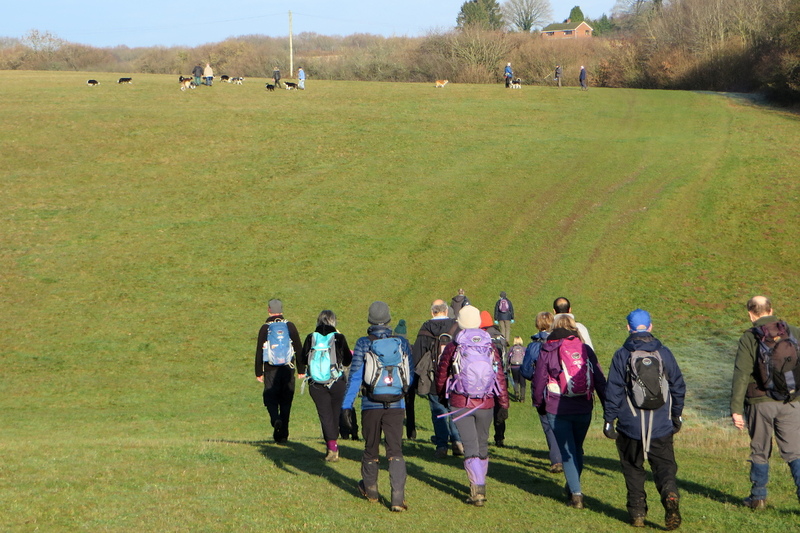 We set off across the gently undulating open fields of Upper Maidensgrove and Russell's Water Common. It wasn't long before we came across what appeared to be a few dog walker with far too many dogs. As we got closer, it became more apparent that this was probably some kind of organised event, such as a dog training exercise. Passing through Woodlands on the Chiltern Way near Pishill. 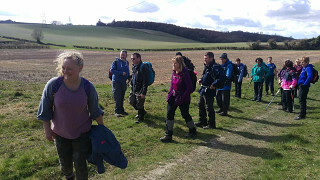 We joined the Chiltern Way and the open fields gave way to the mixed woodland of Pishill Bottom. After some steep ups and downs, we emerged from College Wood into the open farmland of Hollandridge Farm. 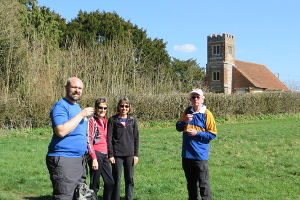 Here we left the Chiltern Way to follow a footpath to Turville Park Farm. A more gentle downhill path took us along the edges of fields until we came to a crossroads by a barn. This was the location for our lunch-stop. There was a grassy bank, which made a good place to sit in the sun while eating our packed lunches. There was also a trailer by the barn, which provided a platform to sit on for those who didn't want to sit on the bank. A sunny spot for our lunch stop. After lunch, we walked through the hamlet of Pishill. Here The Crown Inn would have made a lovely pub-stop, but it was closed for renovation. 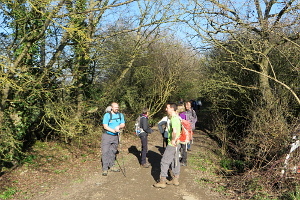 Next came a steeply inclined woodland path at Pishill Bank, which put some of us to the test. At this point a few of us questioned the accuracy of Jane's walk description: The paths rise and fall gently as they cross the hilly terrain. Nonetheless, we all got to the top without incident. There was one more descent and ascent, through Doyley Wood, before we back at the car park. See our route on Google Maps. After the walk, quite a few of us went to The Five Horseshoes in nearby Russell's Water, and the weather was nice enough to sit outside with our drinks. Thank you to Jane for leading the walk and to Jo from providing two of the photos. Stopping off to look at the old Yew Tree at St Michael's Church. 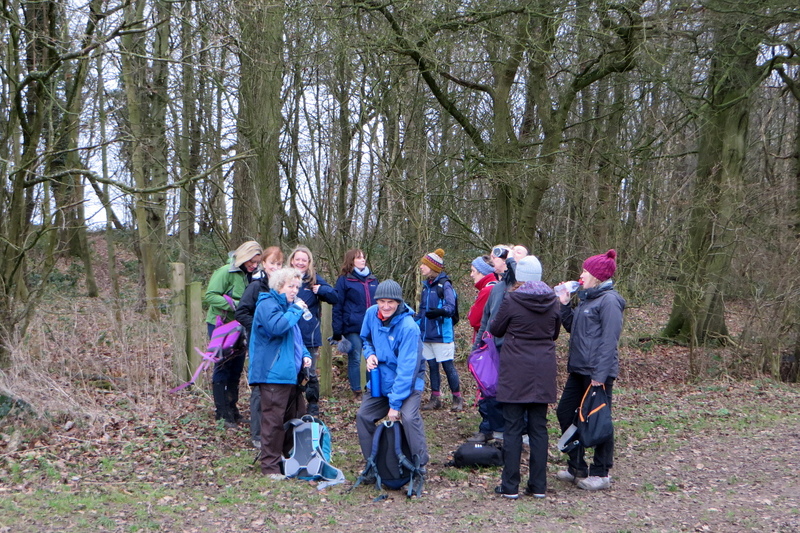 There were fifteen of us on the walk on Sunday 27th January, a mixture of BWW, LVR and new walkers. Several arrived by train, which was good. The weather seemed to go through all the seasons, from sunshine and cloud to brief rain showers and hail. It was of course cold and windy, as predicted, though no-one seemed deterred. 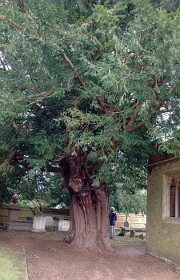 This yew tree is believed to be over 1000 years old. 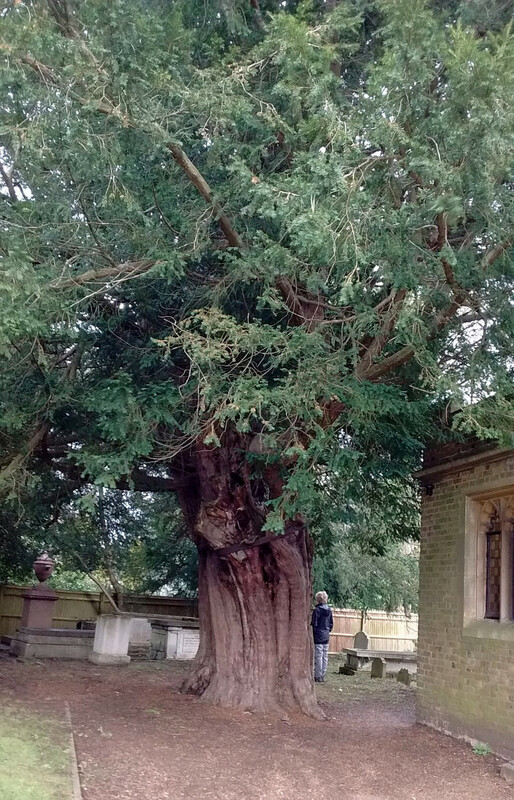 We made our way from Ascot, via roads and light woods, to Sunninghill then had a stop at St Michael’s church to admire the hollow yew tree, said to be over 1,000 years old. 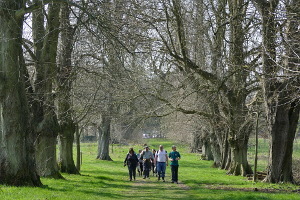 The Church Path then led us aside Silwood Park, emerging on to a long road that we walked, fringing Windsor Great Park. We entered Blacknest Gate to Virginia Water and noted the lake to be very muddy and water levels high, maybe from the heavy overnight rain? Shortly after, we crossed into Coworth Park and our lunch spot. A lucky escape as on reaching it, it began to rain and hail, but we found the picnic tables conveniently and suitably covered by a gazebo! Perhaps they knew we were coming? 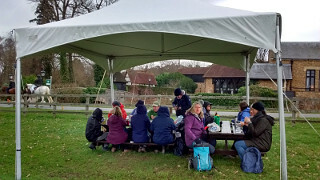 Lunch-stop, complete with picnic benches and a handy gazebo! After lunch, the path becomes a bridleway through woods and was here we met our first mud of the day. Safely through, we the reached the main London Road and soon crossed into Wentworth estate. Here we admired the many palatial properties and wound our way around the fairways of the golf course. 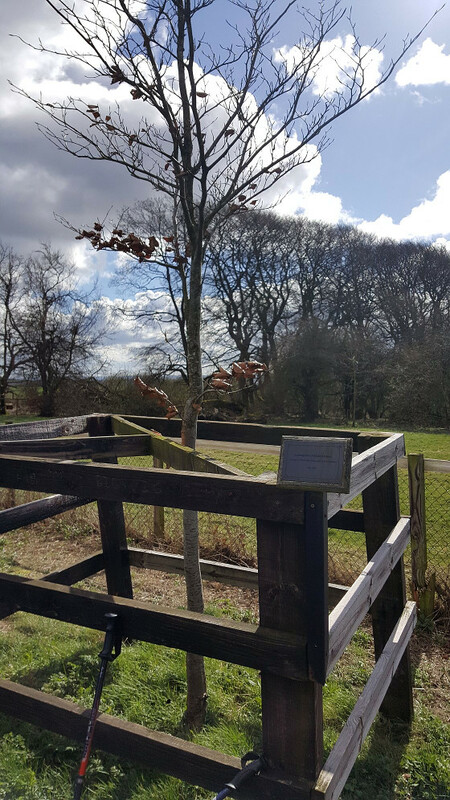 Leaving the estate through some woodland led us to more properties to be admired. Then on via small linked footpaths, past smaller Victorian houses with their own character before arriving on the main A30 in Sunningdale. Here, the end of our walk, and perfectly timed for our return train. Thank you to Kathy and Ann for leading the walk, writing it up and providing the photos. Crossing Ascot Heath in the centre of the racecourse. Sunday 10th February started off grey and drizzly, but this didn't stop thirteen of us, including a couple of newcomers, from turning up. As often happens with days that start like this, the weather improved throughout the day. 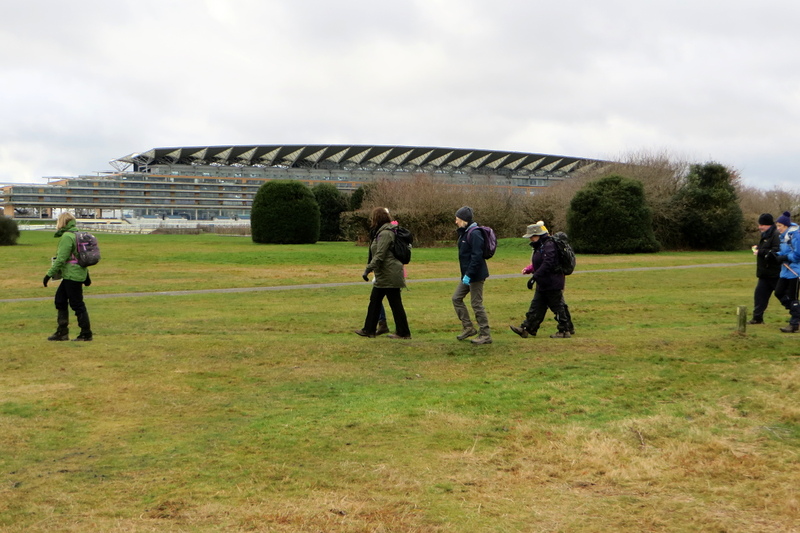 We set off from the car park on Ascot High Street and soon joined the Three Castles Path, which ran parallel to the 'Straight Mile' through a thin strip of woodland before joining Cheapside Road. We followed the road for a short stretch before entering woodland at Penslade Bottom, where we left the Three Castles Path, taking a route past Great Pond to Wood End. Having our picnic lunch in Ascot Heath. Crossing the busy A322 Windsor Road, opposite Loch Fyne, we followed some quieter roads to Woodside. We were a bit early to stop at either of its pubs for refreshment, so we carried on through Brookside Farm and into North Ascot and Burleigh. We re-joined the Three Castles Path as it entered Ascot Racecourse from Kennel Avenue. Here the road crosses the race track in an ingenious way. The track is not high enough above the road for a bridge, so there is a sliding platform with turf on the top and the road just beneath it. It slides on rails, to leave a gap in the track and revealing the road, allowing road traffic to enter the area of land within the loop of the race track. 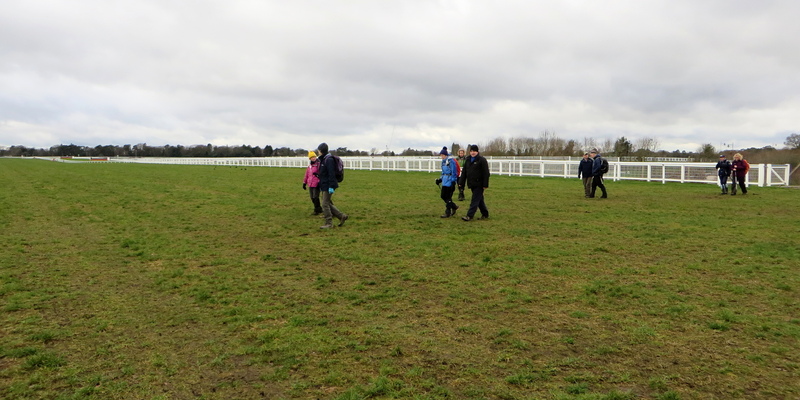 Crossing the Straight Mile at Ascot racecourse. Passing the pavilion of Royal Ascot Cricket Club, we stopped in Ascot Heath to have our picnic lunch. Sitting amongst the low bushes and shrubs, we could clearly see the racecourse grandstand. After lunch, we continued to cross the heath on the Three Castles Path, passing under the race track though a road tunnel. We then walked across the race track itself at the Straight Mile. We left the Three Castles Path at the point we had joined it in the morning and it was then just a short walk back to the car park. See our route on Google Maps. Thank you to Jane for leading the walk and to Colin for providing one of the photos. 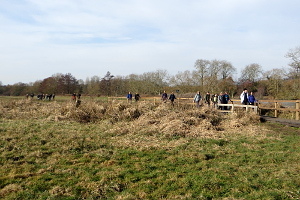 Crossing some marshy ground at Pangbourne Meadow. We joined the Pang Valley Ramblers on Sunday 17th February. 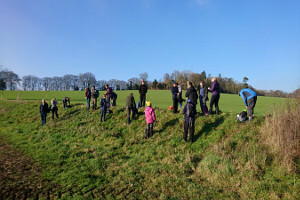 So did quite a few people from several other local groups, making nearly thirty of us! Such was our number that there wasn't room for all of us to park in the same car park. 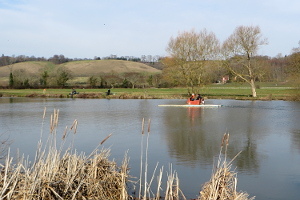 An unusual home-made craft and fishermen on the Thames. Along the way, we saw fishermen on the river banks and boats making their way along the Thames. One particular craft looked rather home-made, with an open plywood box cabin on a raft, powered by an outboard motor. 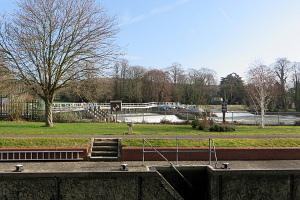 (See picture) Arriving at Mapledurham Lock, we stopped to open flasks of coffee and admire this well-kept, picturesque lock. 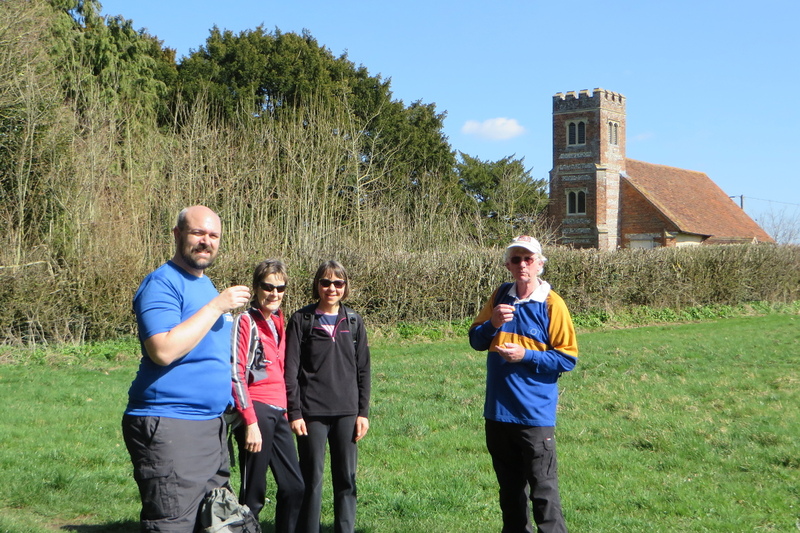 On finishing our refreshments, we left the Thames Path and headed south to Purley-on-Thames. Walking through the village, we crossed the main road and then left on a footpath through fields and mixed woodland. Skirting Mosshall Wood and Vicarage Wood, we had a little bit of road before reaching Sadler's Farm. The weirs at Mapledurham Lock. This was a slight detour, added by the leader to avoid a longer stretch of road walking with such a large group. Looping round and crossing the road again, we were now in Sulham Wood. Here we followed a footpath that gradually descended through the woodland, into open fields, and followed a brook to Tidmarsh. 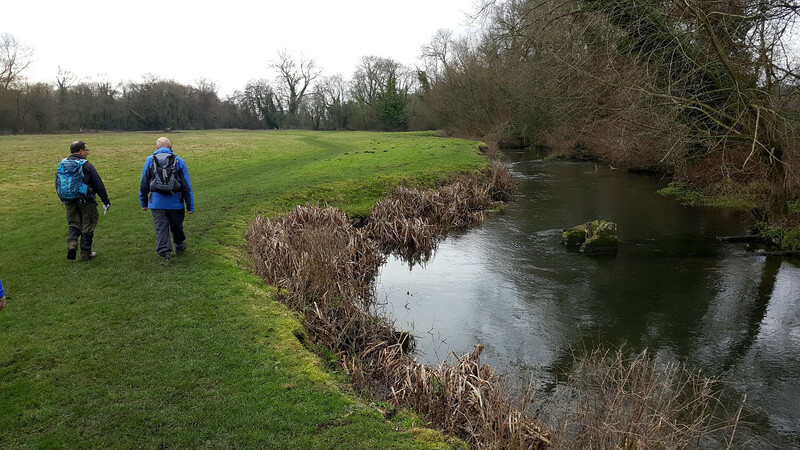 Another short section of road walking got us to a footpath that followed the River Pang to Pangbourne. 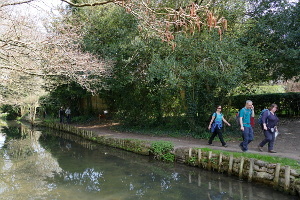 Leaving the river, the footpath became a lane, emerging in the centre of Pangbourne, just a short distance from the village hall car park. It was now clouding over, so we'd made the most of the weather by starting early and not stopping for lunch. See our route on Google Maps. Thank you to Diana of the Pang Valley Ramblers for leading the walk. Leaving Newbury on one of the Berkshire Circular Routes. 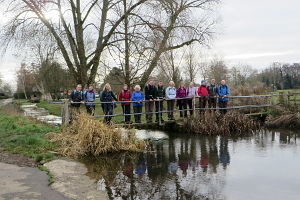 There were fourteen of us for the walk on Sunday 24th February, which included four from the Berkshire Walkers 20s & 30s group, the walk leader being one of them! It was gloriously sunny all day, and quite warm for the time of year, as we explored Newbury's Secret Garden. This was a repeat of a walk Dan had originally led for the National Young Ramblers event last year. Setting off from Newbury railway station, we walked into town to the bridge over the Kennet and Avon Canal, where we joined the tow-path by the Lock Stock & Barrel pub. 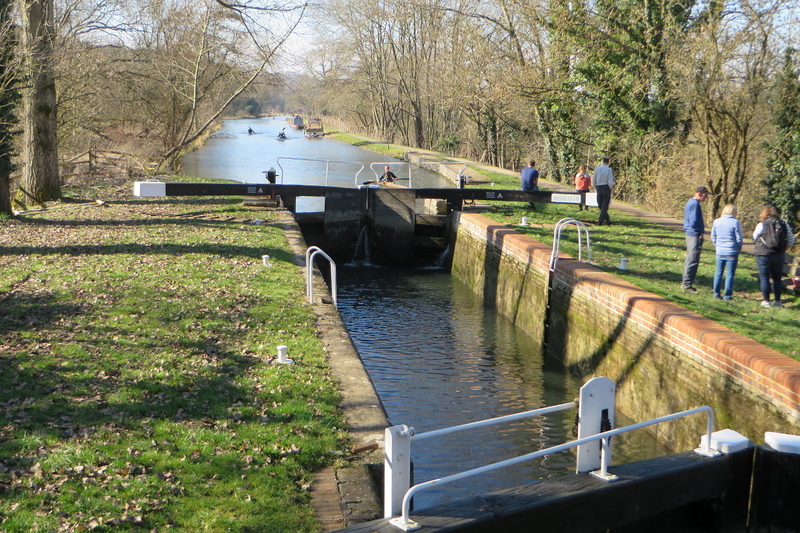 We followed the canal westward for about a mile before heading south along alley ways and footpaths on the outskirts of Newbury. A nice place for lunch, by the lake in Hamstead Park. 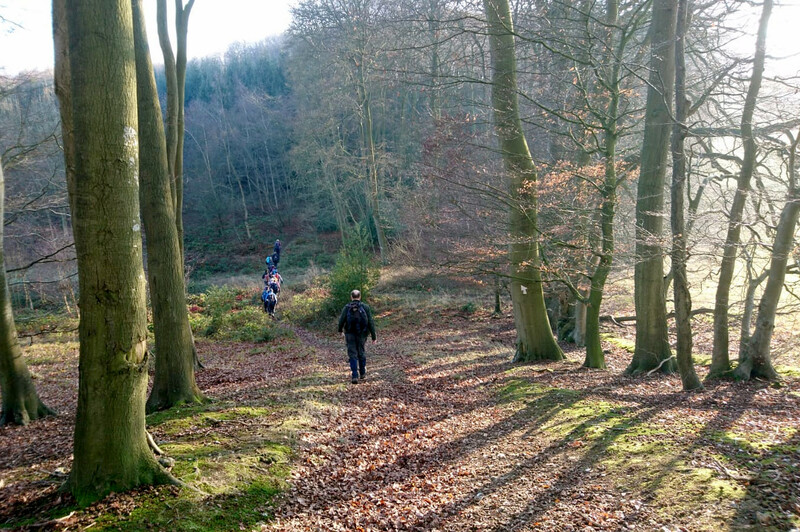 We then joined one of the many Berkshire Circular Routes found on Ordnance Survey maps of the area. This we followed to Skinners Green, where we crossed the A34 on a footbridge, and then through Enbourne into Hamstead Park. Here we left the Berkshire Circular Route and followed a path down to the lake, where we stopped for lunch. A picnic with a view. After lunch we continued through the park, leaving it by Hamstead Lock. Here there were plenty of youngsters navigating the Kennet and Avon Canal in their Kayaks with parents looking on from the safety of the tow-path. We had to weave our way past all the roof-racked people-carriers lining the narrow lane. Canoeing, or is it kayaking, at Hamstead Lock. A lengthy bit of road walking took us through Marsh Benham, across the busy A4, and into Stockcross. Back onto footpaths again, we crossed the River Lambourne at Woodspeen and passed through the picturesque village of Bagnor. Crossing the A34 once again, we followed a wooded footpath that brought us out by Donnington Castle. Here we stopped for a look around. Finally, we walked back into Newbury along various roads, first residential, then Northbrook Street with all its shops, and Market Place. Here we split up, some heading back to the station and car park, while the rest of us popped into the Catherine Wheel for refreshment before doing the same. See route on Google Maps. Thank you to Dan for leading this splendid walk for our group. A rather windy picnic at Radley Bottom. Windy best described the weather on Saturday 9th March, with gusts exceeding 50mph. 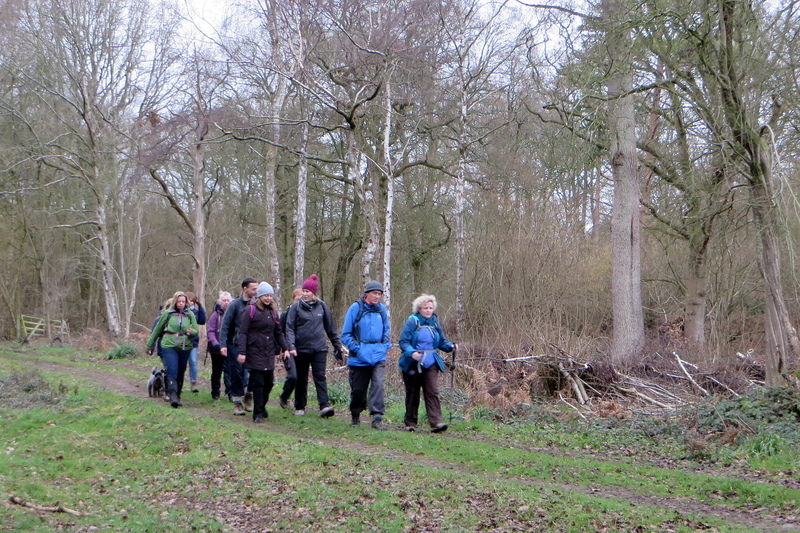 This didn't stop ten of us (including two newcomers) from enjoying a picturesque six-mile walk around Wickham. The walk started off through the hamlet of Wickham, passing the Five Bells pub, before leaving the road for a tree-lined track called Windingwood Lane. This we followed, heading west through Grey's Copse and Wickfield Copse. Along the way, we saw a group of what I first took to be muntjac deer, running across an open field. Some others in the group were sure that these were hares. The question was answered when I disturbed one hiding by the path, which lept up in front of me and ran off. This close, there was no mistake. It was a hare. The Anglo-Saxon church at Wickham. Turning south, we followed an equally muddy footpath down into Radley Bottom. We briefly followed a lane at the bottom of the valley before stopping on a grassy bank for our picnic lunch. Enjoying the sunshine and blues sky, we had to hang on tightly to our sandwiches to prevent them from being blown away! 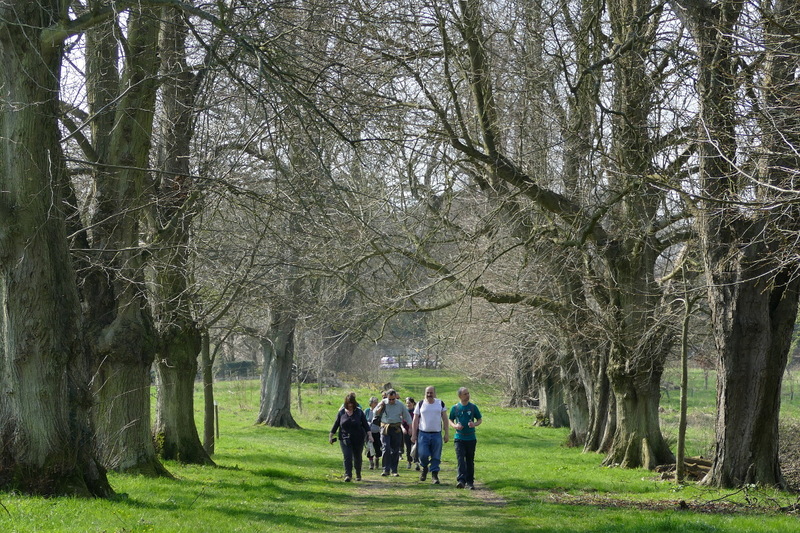 After lunch, we passed through some woodland at the top of the grassy bank, and followed a path through Radley Farm. Curious cows watched us from their cattle sheds as we passed by. A mixture of footpaths and quiet lanes led us eastward to Elcot, and then northward towards Wickham. 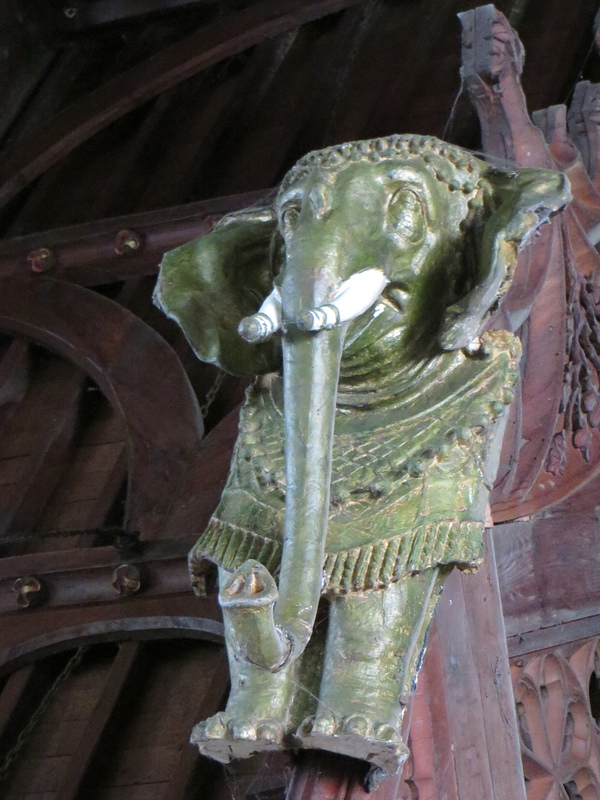 One of the eight elephants' heads in the church. As we entered Wickham, we stopped off to look at the church of Saint Swithun. This Anglo-Saxon church had a few special features that Mike, our walk leader, was keen for us to see. As there wasn't a service taking place, we went inside, after carefully wiping our boots. Inside was a beautifully carved wooden cover over the font, which had been made originally for the Crystal Palace Exhibition of 1862. There was also an unexpectedly elaborate pipe organ, with three manuals and a pedal keyboard. However, Mike had to get us to look up to see the most unusual feature of this little church. Eight papier maché elephants' heads appearing to support the ceiling - originally made for the Paris Exhibition of 1855. It was a short walk from the church back to the centre of the village. See our route on Google Maps. After the walk, some of us popped into the Five Bells to sample their excellent selection of ales (and hot drinks). 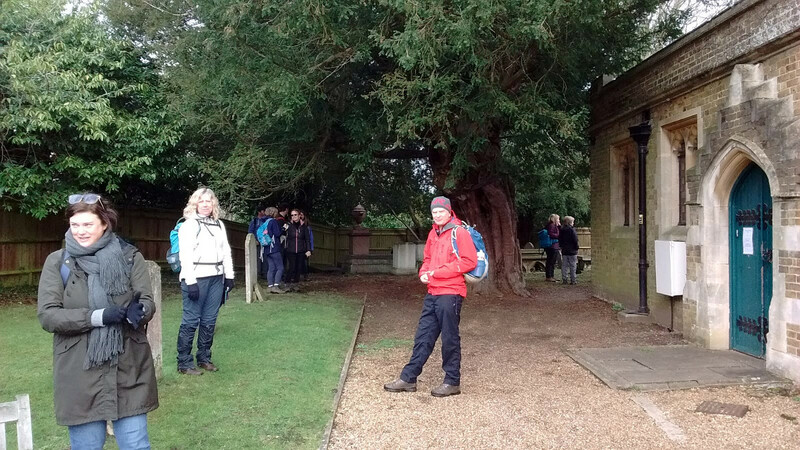 Thank you to Mike for leading this interesting walk and to Sharon for providing the photos. Beech tree and plaque to Richard Adams. On Sunday 17th March, fifteen of us, including a few BWs, a newbie and a not-quite-so-newbie, met up for a 9½ mile walk that turned out to be a 10½ mile walk. This walk was a modified version of a walk I'd led last year. The modifications seem to have added a bit more mileage that I'd expected, but nobody complained. We were lucky that the rain held off until we finally reached the car park. Descending from Nuthanger Down to Sydmonton. Crossing Nuthanger Down, we left the Wayfarer's Walk and headed down a tree-lined path to Sydmonton. Passing through the estate of Sydmonton Court, we got a view of the Grade II listed manor house, private home of Baron Andrew Lloyd Webber and venue of the annual Sydmonton Festival. On the Brenda Parker Way with Watership Down behind us. From there we passed Watership Farm and then ascended a steep footpath to Nuthanger Farm, with its raised barn, also featured in Richard Adams' book. (Again, no rabbits.) A short bit of road walking and then we were on the Brenda Parker Way, which is frequently mentioned in our scrapbook. We chose a spot for our picnic lunch were we had a panoramic view of the downs. This sunny spot being out of the wind was very pleasant. So much so that Dan had a little snooze, stretched out in the sun. We were only able to get him back up by mentioning that our next stop was at a pub in Kingsclere. Walking on the gallops near Kingsclere. 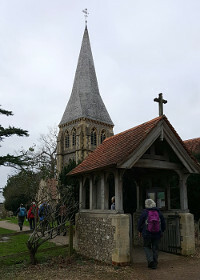 The Brenda Parker Way led us into Kingsclere, passing the picturesque Wells Head and through the church grounds, right to the door of The Crown pub. Was Brenda Parker a lover of real ale? Anyway, we stopped at this friendly pub for refreshments, before heading out of Kingsclere by the playing fields. On the way down to the gallops at Park House Stables, a few of the group finally caught a glimpse of a rabbit in a field south of the village. 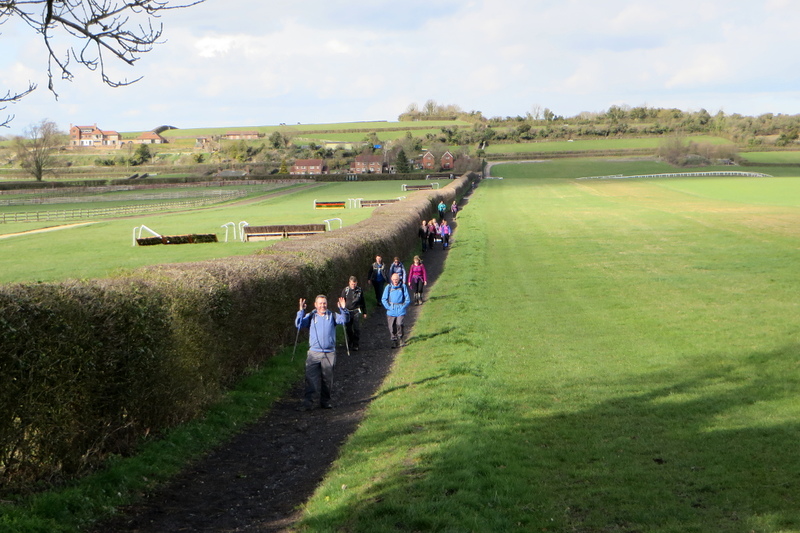 Crossing the gallops, we took a diagonal, but still quite steep, path up Cottington's Hill. Passing the Hannington transmitter mast, we had one more uphill stretch and then it was down hill back to the car park. See our route on Google Maps. Thank you to Denise and Liz for providing the photos. 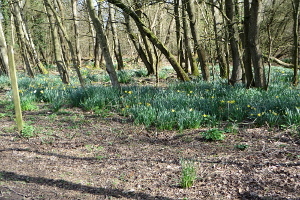 Daffodils in the woodland at The Barracks. 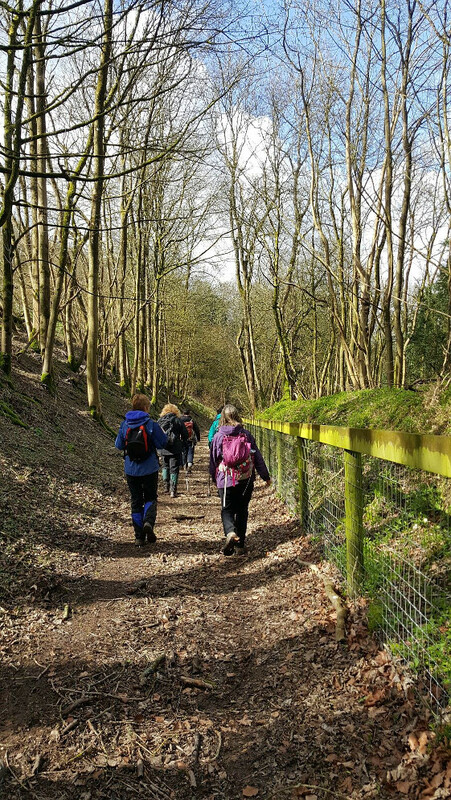 On Sunday 24th March, five of us, including two BWs, met up at Hook railway station for a repeat of the walk I'd previously led for National Young Ramblers 2018 event. It was a nice, sunny spring day, and just warm enough to do without the fleece. We set off, heading westward across Hook, leaving the village on a footpath through Owen's Farm. A year ago I was told this land was going to be a housing development, but it seems to have had a reprieve. For now at least, the horses can carry on enjoying the grassy fields, and we can still walk through this green space. Stopping in Up Nately, by St Stephen's Church. Turning south, we crossed the railway and passed through a small piece of deciduous woodland known as The Barracks, I don't know why. 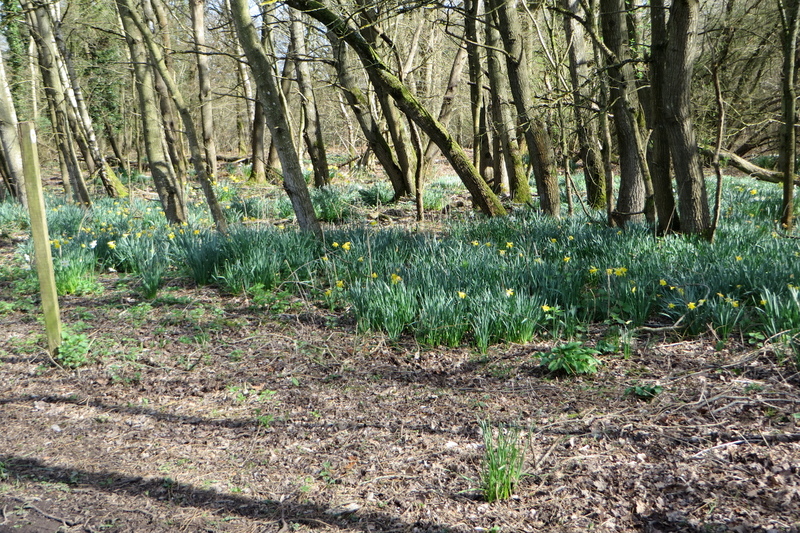 There were daffodils flowering under the trees, making the most of the light before the summer canopy darkens the woodland. Crossing the busy A30, we followed Heather Row Lane through farmland before crossing the M3, where we could see the high towers of Basingstoke in the distance. More woodland tracks brought us to Up Nately, where we stopped for a drink and snack, in a field by St Stephens Church. 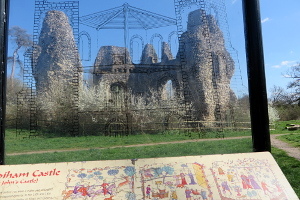 An outline of how King John's Castle would have been. 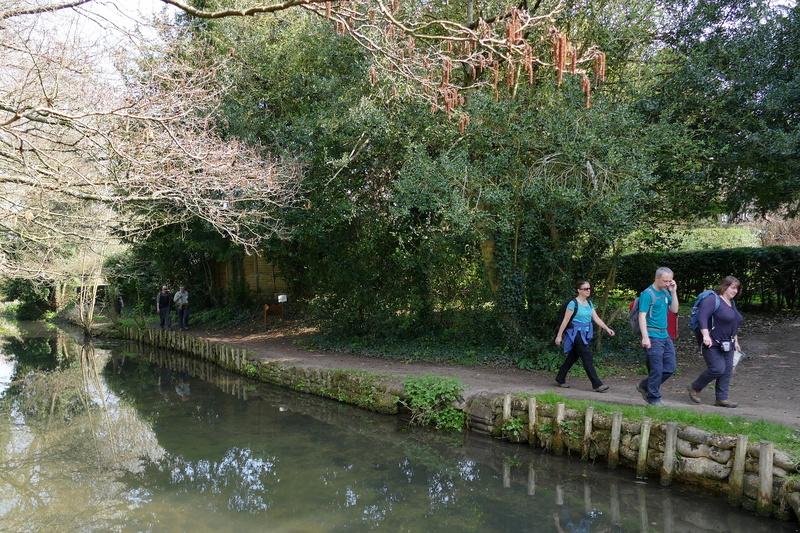 A footpath and a bridge took us over the Basingstoke Canal. This section of the canal has been left to nature while the stretch on the other side of Greywell has been restored. A path led us to the almost hidden entrance of the Greywell tunnel, which is now home to several species of bat. We followed the course of the tunnel overland, passing through woodland and stopping in Greywell Park to have our picnic lunch. Our view was south, over North Hampshire, with RAF Odiham air station just visible by its towers. 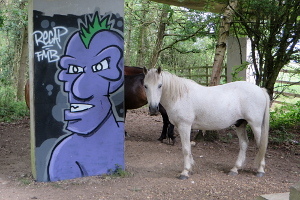 A rather bold graffito on a pier holding up the footbridge over the M3. After lunch we rejoined the canal at the other end of the tunnel and followed the tow-path to the remains of King John's Castle (aka Odiham Castle), where we stopped for a look before continuing on the tow-path. Leaving the canal at the swing bridge, we wandered down to the ford over the River Whitewater at Warnborough Green. Then we stopped off for a drink at The Derby Inn. Leaving the pub, we headed through Bartley Heath, crossing the M3 on a footbridge and following Holt Lane back into Hook. A few alley ways and roads brought us back to the railway station, where we had started. See our route on Google Maps. Some inquisitive sheep. Not sure, but they might be young Jacobs Sheep. This weekend's walk was on Saturday 30th March, so as not to clash with Mother's Day. It also turned out to be the best day of the weekend, weather-wise. 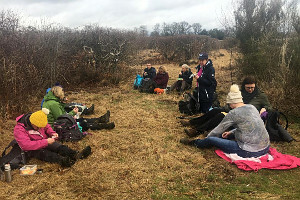 Twelve of us turned up for a repeat of a 7-mile walk that Sue had led about the same time last year, on which day it snowed! See last year's scrapbook entry. We set off from outside the Bladebone Inn at Chapel Row and headed northwards, passed St Anne's Farm and St Crispin's Farm. 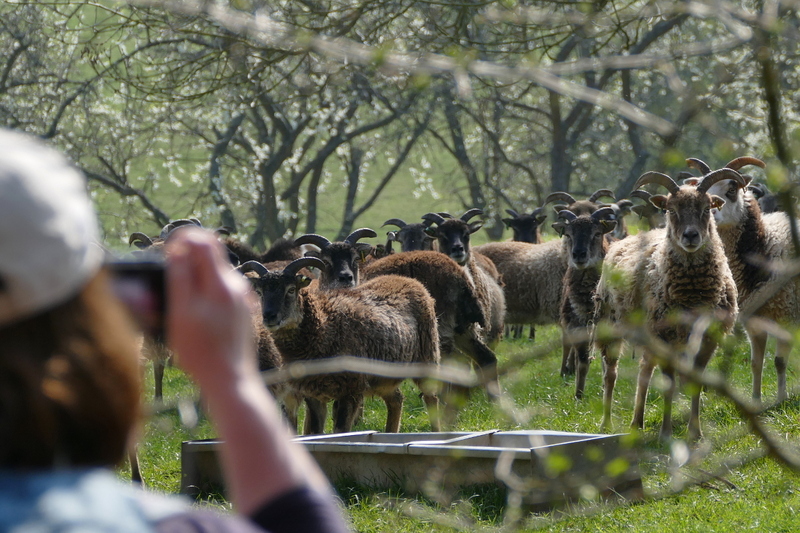 Along the way, we passed a field full of inquisitive young sheep. (Probably too old to still be lambs.) They had a slightly unusual look to them. Someone suggested they might be Jacobs Sheep. Not a variety we see on most of our walks. 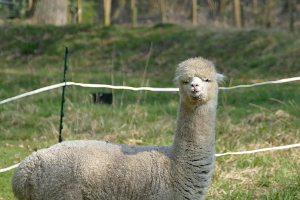 Is it a llama or an alpaca? Anyway, it was watching us. Branching off to the east, through King's Copse, we followed an uphill route to Clay Hill. Here we passed a house with a long garden, at the end of which was a small field containing a couple of llamas, or alpacas, I'm never quite certain how you tell. A bit of road walking to the north was required before taking another footpath to the east, through Jennetshill Wood to Rotten Row. This picturesque hamlet is built on a steep slope. Our leader likened it to a Cornish fishing village because of this. There were some lovely cottages with gardens showing off early flowering plants, such as daffodils, magnolias and cherry blossom. At the top of the hill, we paused for breath before heading east again. On our way to Bradfield from Rotten Row. 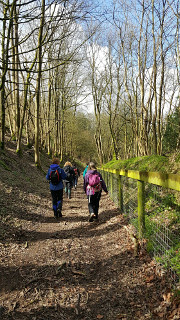 A footpath led us through woodland and across fields on our way to Bradfield. Passing through an avenue of large trees, we joined the road into the village, which we followed up to the crossroads by the college. Two left turns and we were doubling back on a route that followed the River Pang. We stopped for lunch by the river where we found a bench and some steps to sit on. The occasional dog-walker passed us by, busy controlling their dogs, who were interested in us and our lunch! Then we continued along the same path, leaving Bradfield College behind and passing by Bradfield Hall Farm, which is pretty close the Rotten Row, where we'd been earlier. Following the River Pang through Bradfield. 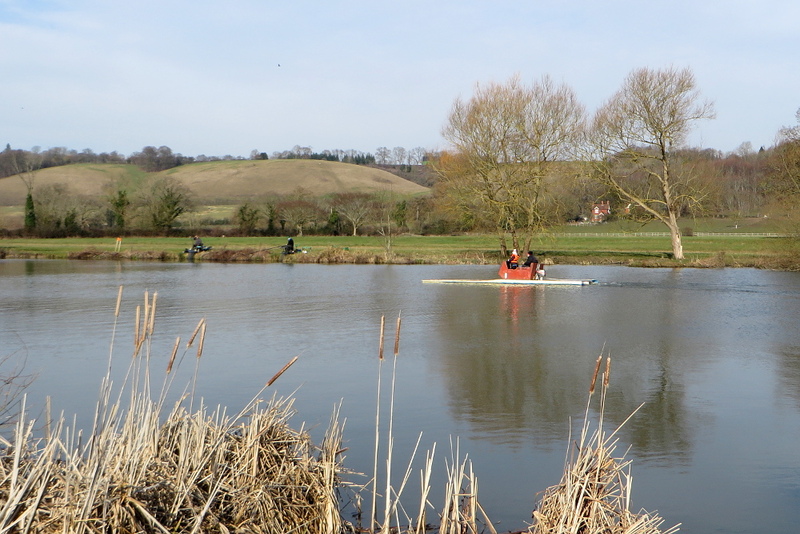 Our route passed the watercress beds by Kimberhead Farm before leading us to the little village of Stanford Dingley. Stopping at The Old Boot Inn for refreshments, we sat in their back garden, enjoying the sunshine. When Sue led this walk last year, they sheltered in the pub by the fire, watching the snow through the windows. Leaving the pub, we followed the road to the west before taking a footpath south. This soon joined up with our outward route, near King's Copse. Retracing our steps, we passed the farms and arrived back at the Bladebone Inn at Chapel Row, where we'd started. See our route on Google Maps.